East Africa needs more renewable energy solutions than ever. With electricity demand in Africa projected to triple by 2030, it’s essential to meet this demand by investing in renewable technologies and diversifying its energy sources. A prime location for solar energy to flourish, the communities of East Africa can achieve a higher quality of life when empowered with renewable energy. The International Energy Agency (IEA) estimates that 1.2 billion people worldwide did not have access to electricity in 2013. More than 620 million of those people live in sub-Saharan Africa. In terms of energy access, East Africa is the most affected region of the continent (see Figure 1). These statistics convey the dire situation faced by many East Africans, especially those in rural areas. Even those fortunate enough to have access to electricity experience a service that flows sporadically and is costly. 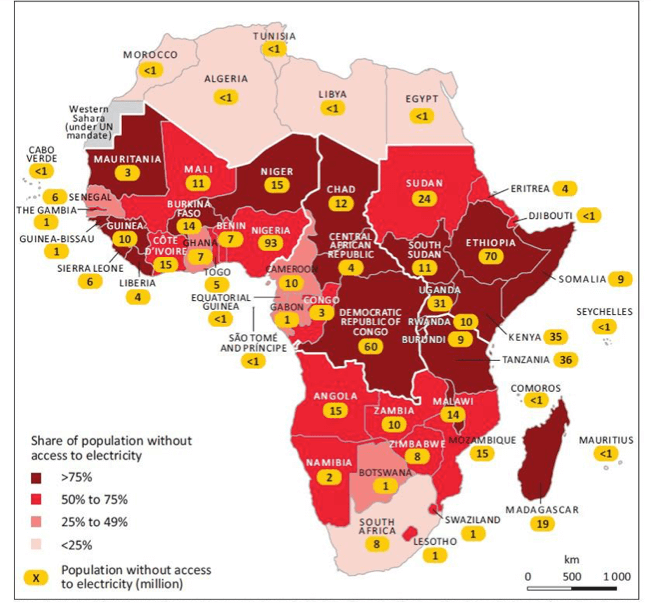 Figure 1: Number and share of Africans without access to electricity by country in 2012. Taken from the International Energy Agency. For comparison, the average energy price in the East African Community (EAC)—which is made up of the Republics of Burundi, Kenya, Rwanda, South Sudan and Uganda and the United Republic of Tanzania—is 14.8 US cents per kilowatt-hour. The average energy price in Canada, one of the lowest in the world, is 8.11 US cents per kilowatt-hour. However, Canada’s gross domestic product (GDP) per capita is US$43,248.50 compared to the EAC’s GDP per capita of US$770.18. The IEA predicts that, by 2040, renewables will potentially provide more than 40% of all power generation capacity in the region. To help alleviate energy challenges, the continent’s abundant renewable energy potential should be harnessed. Africa is home to vast renewable resources, including geothermal, wind, hydro and solar energy. These energy resources have not been harnessed to their full potential, as modern renewables account for less than 2% of the sub-Saharan energy mix. However, there is an increase in the use of renewables in the region. For instance, Kenya is now the world’s ninth-largest producer of geothermal energy and has plans to expand the existing Olkaria Geothermal Power Plant, doubling its capacity by the end of 2016. The Lake Turkana Wind Power Project, also located in Kenya, is a 40,000-acre wind farm that aims to provide reliable and low-cost wind power to Kenya’s national grid. The EAC currently uses hydropower as its predominant electricity source. However, over-reliance on a single source of energy can lead to potential challenges. In Africa, there is a concern that hydropower systems could be compromised by reduced rainfall and increased evaporation. Further, the development of these systems has put indigenous communities who rely on natural flood cycles to sustain their life at risk, as the flood water is being used to fill reservoirs to generate hydropower. Energy diversification can help reduce the stresses placed on the environment and communities in the area. Electricity demand in Africa is projected to triple by 2030. To meet this demand, it is essential to invest in other renewable technologies to help diversify energy sources. Investment activity is already evident in the EAC region, but will need to increase considerably in order to make a significant impact on the availability of electricity. Between 2010 and 2015, the EAC attracted approximately US$4 billion of investment in utility-scale renewable energy (see Figure 2). The region saw US$139.8 million raised by companies expanding their activities in off-grid renewable energy projects in 2015 alone. According to CB Insights, the renewables industry has been one of the top industries for early-stage investments in East Africa since 2012, behind mobile and Internet software and services. The industry has seen a mixture of investments from sources including angel investors, venture capitalists and incubator programs. Solar energy has seen the bulk of investment activity in renewables, as East Africa is in a prime location for solar energy to flourish. 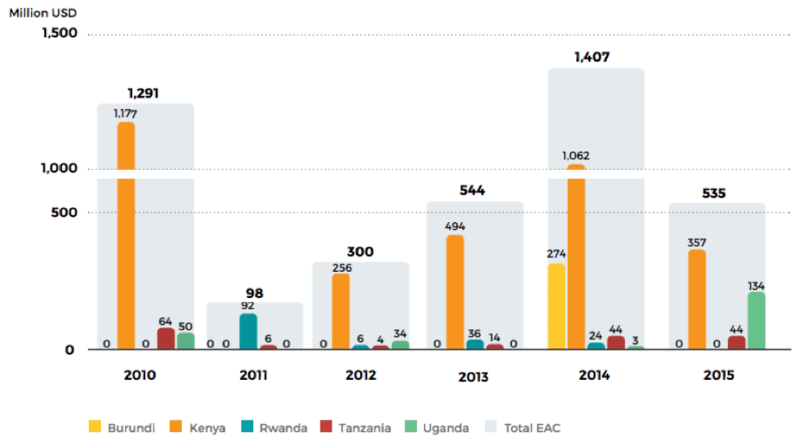 Figure 2: Investment in renewable energy in EAC partner states, 2010 to 2015. Taken from EAC Renewable Energy and Energy Efficiency Regional Status Report. East Africa is well suited geographically for solar electricity generation, receiving some of the highest levels of horizontal irradiation in the world (see Figure 3). Some areas of East Africa have irradiation concentrations reaching over 2,400 kilowatt-hours per square metre and are among the highest levels in the world (see Figure 3). Figure 3: Horizontal irradiation shown globally and for Africa. Taken from Solargis. East Africa’s population is rapidly increasing. The average annual population growth rate was 2.7% over the five-year period from 2010 to 2014 for the EAC. The region has a young population with a growing middle class, and the use of mobile infrastructure is on the rise. These population trends mean that energy demand will also increase, and meeting this demand with renewables is essential to a sustainable energy outlook for the region. Local governments have implemented a number of policies and incentives enabling renewables. Many East African countries, including Uganda, Tanzania, Mozambique, Zimbabwe and Malawi, have Feed-in Tariff (FIT) programs in place. One notable feed-in tariff initiative is the Get FiT program, a project that has been rolled out in Uganda, where 15 small-scale renewable energy generation projects with a total of 125-megawatt capacity will be fast-tracked, helping the country get closer to reaching its goal of having 61% of its energy consumption coming from renewables by 2017. There are a number of solar energy initiatives underway in East Africa. For instance, it is projected that the installed capacity of solar photovoltaic systems in Kenya will reach 100 MWe, generating 220 GWh annually, by 2020. The Kenyan government is running a program to clean up dirty diesel plants by hybridizing 15 off-grid diesel power stations with solar and wind. The country is expecting a strong uptick in solar water heating, with a projected 800,000 units installed by 2020, a 20% annual growth rate. There are also a number of large-scale solar projects operating in the region, including a 40-megawatt solar plant in Kenya run by Kenya Solar Energy Ltd. The Kenyan Ministry of Energy and Petroleum and SkyPower, the largest developer of utility-scale solar energy globally, have signed an agreement to build 1 gigawatt of solar energy projects in Kenya throughout the period of 2015 to 2020. East African nations are also incentivizing the adoption of solar and renewable technologies through several tax exemption programs. For instance, the EAC has an import duty exemption, reducing import duties to 0% for certain technologies, including photovoltaic cells and modules. Tanzania and Kenya have additional tax exemptions, such as the removal of value-added tax on solar products. East Africa lacks the sufficient infrastructure for transmitting electricity from generating stations to the rural communities where 74.4% of East Africans live, leaving four out of five East Africans without electricity. The infrastructure currently in place is also quite inefficient, with power transmission and distribution losses in sub-Saharan Africa averaging 18%. Distributed generation can offer a leapfrog over the need to build out costly transmission networks and infrastructure. Distributed solar and solar microgrids are a great fit due to East Africa’s high solar insolation rates (see Figure 4). Kenya Power is already rolling out this technology across the region, using solar microgrids to bring energy to remote Kenyan communities through the Last Mile Connectivity project. Startups are also exploring the opportunity to bring solar generation directly to the homes of rural East Africans who are not connected to the grid. Off Grid Electric and M-KOPA Solar are two East Africa–based companies striving to bring clean and affordable energy to the region. In 2015 they were the top off-grid solar companies to raise capital in the EAC (see Figure 4). Off Grid Electric currently has 100,000 customers in Tanzania and Rwanda using an affordable pay-as-you-go program after a $6 installation fee for solar panels that are installed on the roof of their homes. The package also includes a meter to keep track of energy usage, LED lights, a radio and a phone charger. M-KOPA Solar strives to make high-quality energy affordable to everyone. The company has connected more than 400,000 homes with affordable solar power in Kenya, Tanzania and Uganda. Customers pay an initial $35 deposit, followed by 365 payments of 45 cents. In return, they receive a solar home system that includes multiple lights, a phone charger and a radio. M-KOPA Solar has also found great success with their TV system program. The company has sold over 10,000 units since the pilot program launched in February 2016. Traditionally, gaining access to TV is very difficult for rural communities. This hinders off-grid populations from accessing information first-hand. Women and children are especially affected, as they often stay closer to home. M-KOPA Solar has transformed how their customers access information and enabled them to enjoy TV from the comfort of their homes. The global community is taking notice of the energy issues affecting East Africa. For example, Canadian companies have developed innovative solutions to help support the East African region with solar energy. Figure 4: Capital raised by off-grid solar companies, world and EAC totals and by company, 2015. Taken from EAC Renewable Energy and Energy Efficiency Regional Status Report. Solar Ship, based in Brantford, Ontario, is working to combat two of Africa’s problems—clean fuel and lack of infrastructure—with one solution. 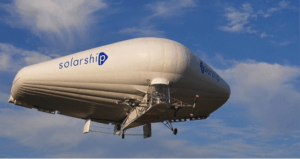 “We wanted to build a machine that would be able to connect remote areas to the rest of the world,” explains Jay Godsall, the CEO of Solar Ship. Solar Ship aircraft. Image taken from Solar Ship. Solar Ship has invented aircrafts that are capable of servicing remote areas inaccessible by roads. The company has designed their vessels to be powered by either solar energy through panels on the planes’ large surfaces or through traditional combustion. Solar Ship is addressing East Africa’s remote communities’ need for supplies and the company is kicking off its initiative with the Manaf Freighter of Burundi, delivering food, clothing and medical supplies to rural East African communities. One of Solar Ship’s key assets is its aircrafts’ ability to land in a small space, like a soccer field, rather than requiring a runway. Hear more about Solar Ship and Africa’s tech market from Michel Rugema, the chief operating officer of Solar Ship, on November 1, 2016, at MaRS’ Going Global: Africa’s Emerging Tech Market event. Karibu Solar Power, another Canadian startup, is making energy available at an affordable price to off-grid Tanzanians. 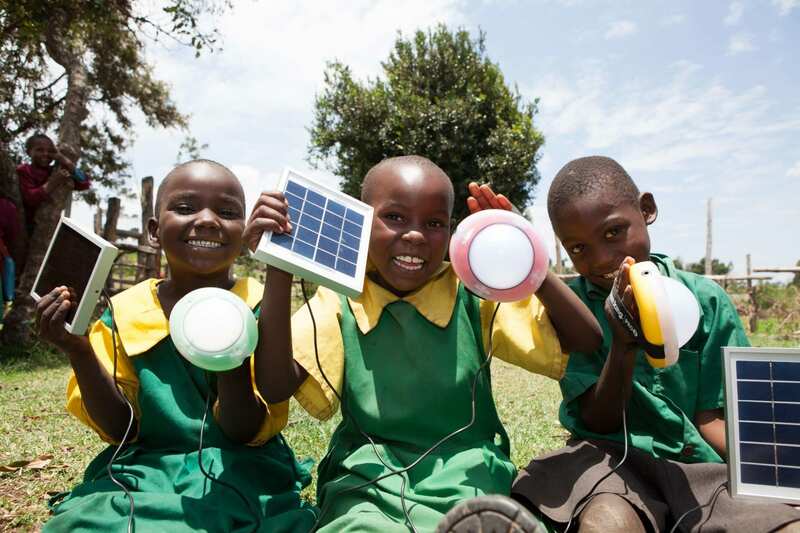 The company manufactures and distributes a solar pay-as-you-go kit containing a solar panel and two “hockey pucks,” which are lights/phone-charger units, offering a clean way for unconnected Tanzanians to generate electricity to meet their basic needs. The system’s pay-as-you-go model runs at a similar cost to kerosene, around US$1 a day, making it an affordable alternative to the toxic fuel. Jaza Energy of Halifax, Nova Scotia, is working to light the homes of Tanzanians living on Pemba Island. Like Karibu, Jaza is solving the issue of home lighting and cellphone charging that many East Africans face. The company’s idea is to build community solar hubs and portable energy storage packs. Citizens will each own a storage pack that they can bring to the hub to charge. The pack can then be taken home and used to power an LED lighting kit. Africa’s economy is on an upward trajectory, growing at the second-fastest rate in the world. The continent’s economic growth has remained stable amid a weak global economy. In 2015, Africa’s real GDP averaged a 3.6% increase, topping the world average of 3.1%. This economic stability is predicted to continue, making the continent a favourable environment for investment in long-term renewable projects. While there is growing activity in solar investment, some investors may be wary of the foreign exchange risk and rising interest rates in the region. According to the Kenyan Ministry of Energy and Petroleum, the nation’s uncoordinated approach to policy implementation, its poor promotion of solar energy projects and its weak enforcement of standards and regulations are barriers to the adoption of solar energy. Additionally, solar projects tend to have a high upfront cost and there have been issues with theft of panels. Entrepreneurs can view these challenges as an opportunity to provide innovative solutions. Despite the barriers associated with investing in and initiating solar energy projects, there is great potential already being explored. Off Grid Electric and M-KOPA Solar demonstrate that modern renewables can empower local communities to achieve a higher quality of life. Harnessing solar energy on a smaller scale can contribute to rural development and electrification without requiring governments to overextend the national grid to remote locations. East Africans can now look forward to a bright future thanks to the efforts of solar innovators in their region and around the world.